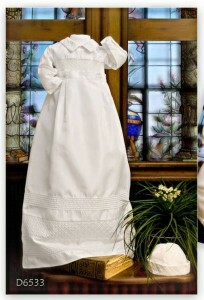 Little Darlings Claudia christening gown G9013. 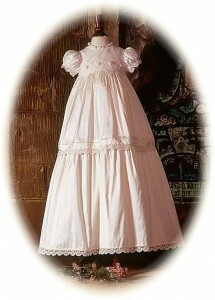 Silk christening gown and bonnet. Little Darlings Claudia christening gown. 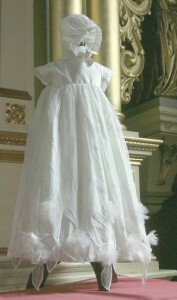 FREE SHOES OF YOUR CHOICE WITH THIS CHRISTENING GOWN ! 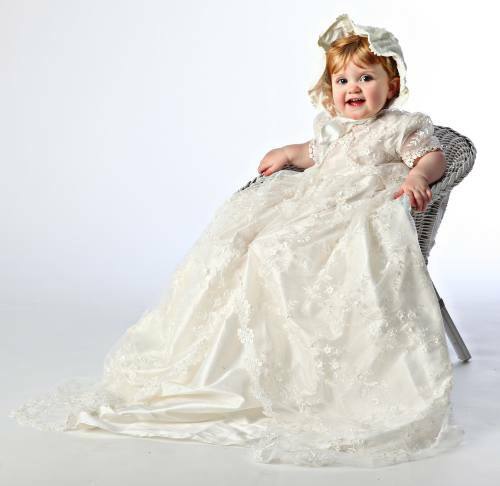 Just let us know, in the Order Notes box at the Checkout, which style, colour and size you would like and we will ensure that they are included with your christening gown. Please do not add them to your basket, or they will be charged. 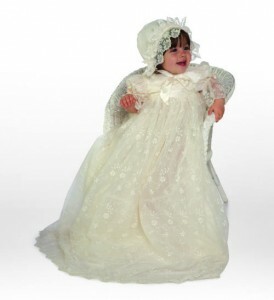 Just imagine your baby girl wearing this beautiful christening gown on her Special Day ! The ivory dupion silk bodice has puff sleeves. The silk skirt has an overskirt of ivory lace, lavishly embroidered with flowers and edged with guipure lace. The overskirt is open down the front to reveal the skirt. Little darlings Claudia christening gown is extra long, measuring 112cms (45 inches) down the centre back from neck to hem. The outfit includes a short sleeved bolero in the same embroidered lace, trimmed with guipure lace and fastened with three pearl buttons..
A matching silk bonnet, overlaid with embroidered lace, adds the finishing touch to this truly beautiful outfit. 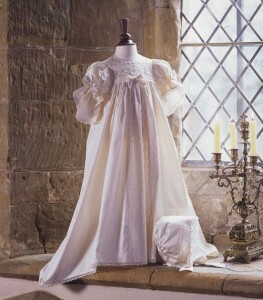 Future generations of your family will treasure this exquisite, top of the range christening gown from Little Darlings. Looking for a special Christening Gift ? Visit our Christening Gifts website for a great selection of interesting and affordable christening gifts. Copyright 2015 The House of Honfleur Limited. All Rights Reserved.